Gavdnjajávri is a lake in the municipality of Kautokeino-Guovdageaidnu in Finnmark county, Norway. 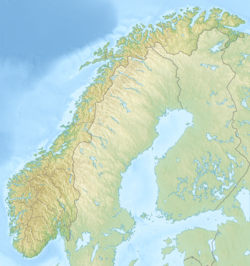 The 3.84-square-kilometre (1.48 sq mi) lake lies on the Finnmarksvidda plateau inside Øvre Anárjohka National Park, about 5 kilometres (3.1 mi) north of the Norway-Finland border. ^ "Gavdnjajávri" (in Norwegian). yr.no. Retrieved 2013-04-03. This page was last edited on 6 July 2018, at 01:55 (UTC).